The summer school for teenagers between 16 and 19 is located directly next door to the school for adults. Lessons take place at the ActiLinuga Dependance Sacré Coeur at about 2 minutes walking distance from Actilingua´s main building. It has a spacious park and many sports facilities. The summer school for 16-19 is centrally located in Vienna's embassy district; opposite "Schloss Belvedere"
The following extras are not included in the price but can be booked by us for you. Prices are an indication. The German course for young people from 16 to 19 in Vienna is the intensive course of 20 or 30 weekly lessons but which is specifically for this age group. You will participating in the programme with students of approx. 15 different nationalities and you can choose between 20+5 or 30+5 weekly lessons. The focuss is on practising grammar, vocabulary, pronunciation and auditory comprehension with the emphasis on real life situations. The following extras are not included in the price but can be booked by us for you. The young adults course is suitable for students aged 16-19 years and includes residence accommodation in shared rooms with half board and a program of activities. For the youth courses, excursions (full-day and half-day) are not included in the price; costs are approx. € 70 (full-day) / € 40 (half-day). Supplement single room: € 68 per person per week on the price of twin room. Please note: residence will be open from 01/07/2019 which is why on the first course starting date (01/07/2019) students will have to arrive on MONDAY. The indicated price is only for an one way transfer upon arrival at the airport of Vienna to the accommodation. If you would like to book a transfer for the return journey, please inform us when making your reservation. Please note: residence will be open from 01/07/2019 which is why on the first course starting date (01/07/2019) students will have to arrive on the Monday. Course participants are accommodated in a modern Residence/Student House in 2-3 person rooms with a private bathroom and lodging based on half board. Meals take place at the school. 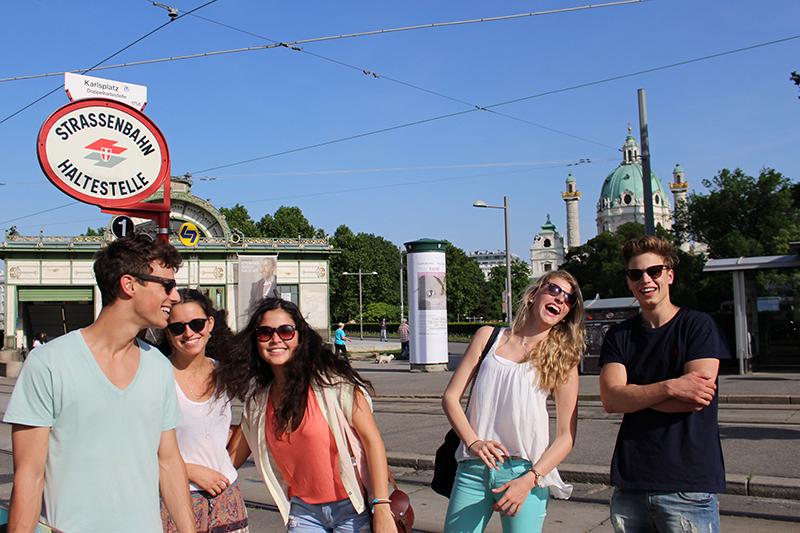 The accommodation for 16-19-year-olds offers a young and international atmosphere in the centre of Vienna. It is a modern, urban and central residence. The residence is located approx. 15-25 minutes from the city centre and the school by public transport. Costs for public transport are about €17 and not included in the course price. The rooms are cleaned once a week. Bed linen is provided and changed fortnightly. Each room has its own fridge and Internet. Internet (by cable) is available for an extra charge as are coin operated washing machines and a dryer. Holiday course students are independent and treated like young adults. There is no supervision in the evenings.